Gemba walk is an opportunity to capture topics and concerns related to how effectively your team is performing. Learn what should you do when doing a Gemba walk? Insanity is doing the same thing over and over again and expecting different results. From such a perspective, most of the contemporary managers seem to be insane. Why? Because you cannot expect different results from your team by sitting in your corner office and only attending KPI meetings. Instead, you need to see where the real work happens. You need to do Gemba walks. The Gemba walk is an essential part of the Lean management philosophy. Its initial purpose is to allow managers and leaders to observe the actual work process, engage with employees, gain knowledge about the work process and explore opportunities for continuous improvement. Let’s explore the Gemba walk in detail. 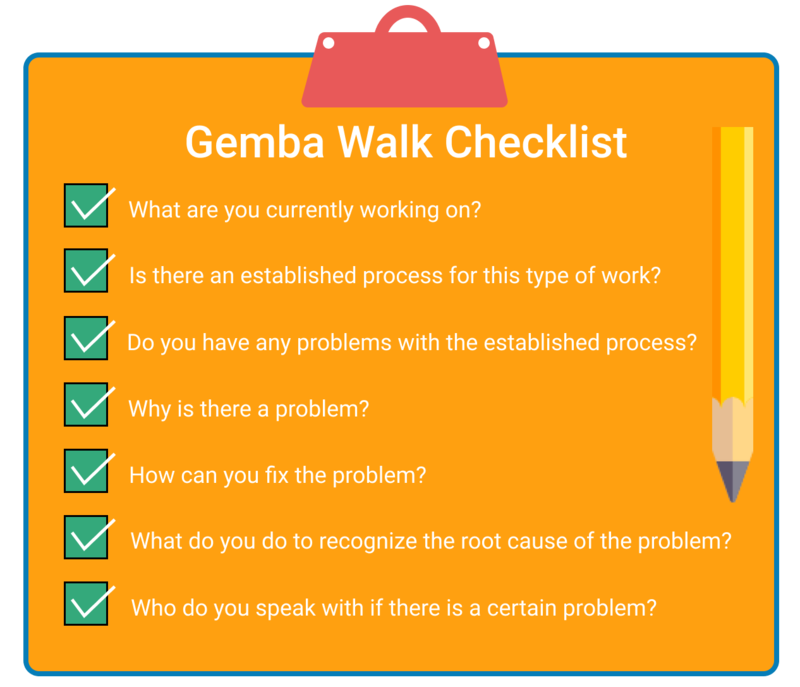 What Is a Gemba Walk Actually? The term “gemba” comes from Japanese and it means “the real place”. In Lean management, “gemba” is the most important place for a team as it is the place where the real work happens. Quite simple, for rock bands the “gemba” is the recording studio. For Formula 1 teams the “gemba” is wherever the car is. For manufacturers it’s the factory floor and so on. In other words, it is where the real work happens, so you can observe and analyze it. ?he Gemba walk is a concept developed by Taiichi Ohno, who is often considered the father of Just-in-time production. By developing such a concept, Ohno offers a real opportunity for executives to leave their daily routine, see where the real work happens and build relationships with workers based on mutual trust. Go and see. The main idea of the Gemba walk is managers and leaders on every level to take regular walks around the shop floor and to be involved in finding wasteful activities. Ask why. The main objective of a Gemba walk is to explore the value stream in details and locate its problematic parts through active communication. The good leader is always eager to listen rather than talk. Here is why you may use different techniques such as 5 whys in order to identify problematic parts of the process. Respect the people. Have in mind that a Gemba walk is not a “boss walk”. Pointing fingers and blaming people is exactly what you don’t have to do. You are not there to judge and review results. You are there to collaborate with the team and find problems together. Try to focus on finding the weak spots of the process, not of the people. Before you walk the shop floor, you need to make a plan and follow the steps. The plan should depend on your goals and objectives. Sometimes it may be unstructured, for example, if you are new to the organization, while in other cases your plan will be much more precise because you will be more familiar with the details. In any case, be prepared for the Gemba walk. Otherwise, it will be inefficient. Now, let’s define some basic steps. Pick a theme. When you go to Gemba, you have to choose a theme. This will help you focus all your efforts and be effective. There are different themes you may want explore such as: productivity, cost efficiency, safety and etc. In order to be as much precise as possible, you will also need to prepare a list of question you are going to ask. Prepare your team. The team that will be observed should be prepared for what is going to happen. All team members need to have a clear understanding that the Gemba walk is a common process where the final destination is continuous improvement. This way workers will feel much more comfortable and willing to collaborate. Focus on process, not on people. You need to remember that a Gemba walk is not the right time for evaluating the performance of your team. The main purpose is to observe, understand and improve the process. If you focus on people’s personal abilities, you will only face a resistance. Be where the value stream is. Following the value chain will give you the best opportunities to identify areas with a high potential of waste activities. Eliminating those activities will help you improve the overall performance. Record your observations. Don’t make suggestions during the walk. Write down everything that grabs your attention or even record it with your smartphone. In some cases, you will probably be tempted to offer a solution immediately, but this would be wrong. Leave the analysis for later. You will be much more precise after you have all the facts available. Furthermore, the broad overview can offer you opportunities to use effective problem-solving tools such as PDCA cycle. Much better than an instant gut feeling. An extra pair of eyes. It may be a good idea to invite a colleague from another department. Someone with totally different daily tasks. People who are less familiar with the processes usually have a fresh point of view and ask different questions that you may never ask. Follow-up. Even if you don’t find anything significant during your Gemba walk, you need to share with the team what you have learned or seen. Otherwise, the team will only have the feeling of being watched. If you are going to take actions after the walk, inform the team about the upcoming changes and why they are necessary. 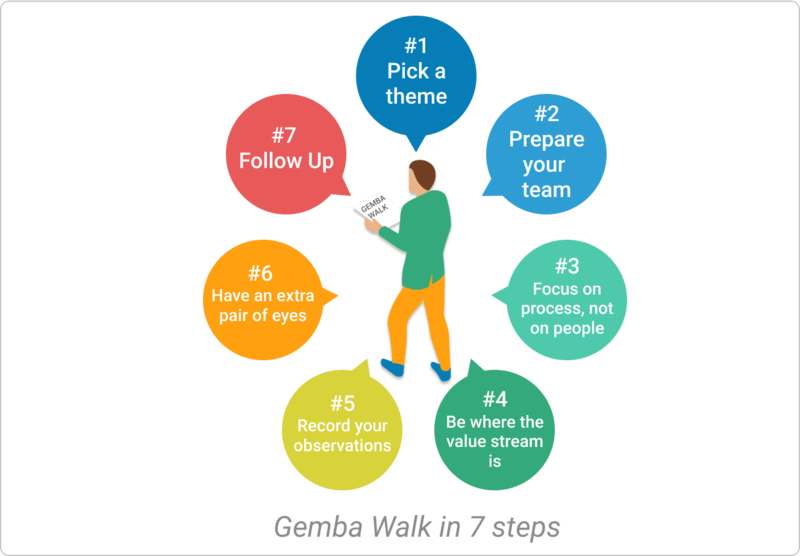 Every time when you perform a Gemba walk, you need to prepare a checklist in advance. This list will help you focus and target your efforts. The checklist has to include questions that will help you understand the process you are going to observe in a better way. Your questions may vary depending on the theme of your Gemba walk. These questions will defer when exploring different areas such as: problem-solving, innovation, resources, tools and etc. So before you go Gemba, prepare your checklist carefully based on the area you want to investigate. Before you take any actions based on your Gemba walk observations, you will need some time to organize your thoughts and notes. Feedback is important, but early feedback may be devastating. Here is why you need to sit down with the leadership team and carefully analyze the situation. You can even invite some of the workers who you’ve observed. For example, the ones who gave you the most insightful information. Use all the data that you collected as part of your continuous improvement process, also known as as a Gemba Kaizen circle. It is a meeting held after each Gemba walk that may include a few participants from different departments. The main purpose is to have as many different points of view as possible in order to make the best decision. A decision that will actually bring improvement. It is important to go around the shop floor and collect insightful information about what needs to be improved. However, what matters most is to go back where you started. A post-Gemba walk closes the loop and shows respect to the people that have been observed. This will make it much easier to lead a successful Gemba walk in the future. Building stable relationships with those who actually do the work and create value. Identifying problems and taking actions for achieving continuous improvement much faster. Clearly communicating goals and objectives leading to increased employee engagement.